所以，BRAND SIMPLE只是第一步，看看CANNES 大奖作品，HBO VOYEUR不就清楚了吗？表达了IT IS HBO，一家注重原创的电视台的品牌精神吗？对了，HBO真的不是家普通的TV. not even for our Clients. To find a different and relevant brand idea, look for the obvious. The best answers are usually right under your nose. Good brand people never stop looking for insights, and they know to look in the most obvious places. They read letters from customers, go to call centers, speak to retailers, hang out in supermarket aisles. The key is to find something meaningful that no one has noticed before. Make sure your brand idea aligns with your business strategy. What exactly are you selling? 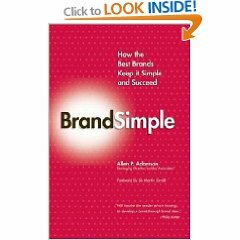 Is your brand idea in sync? You can deliver what your brand idea promises to deliver by validating the brand experience at optimal points of customer contact.